The National Religious party “The Jewish Home” today has only 3 representatives in the Knesset. But current polls say that in next month’s elections, The Jewish Home will win 13 seats, making it the THIRD biggest party in the Knesset after the Likud and Labor. What happened is that a man named Naftali Bennett took over as head of the party in November enabling it to gain 10 mandates in ONE MONTH. -Served in the IDF’s elite “Sayeret Matkal” unit and commanded troops in the 2nd Lebanon War as a Major. -Established the Hi-Tech company “Cyota” which was sold in 2005 for 145 million dollars. In addition to his professional achievements, Bennett is a deeply religious person who is close to Rabbi Avichai Rontsky, the former rabbi of the IDF, and very dedicated to the Torah and the Land of Israel. He and his wife Gilat live in Raanana with their four children. But what really convinced me that Naftali Bennett is a person who is worthy of the widespread hero status he has been granted is how he responded during this half-hour interview on Israeli television. You don’t have to understand Hebrew to find this interview awe-inspiring. All you have to know is that Bennett is being ferociously attacked from all sides from the very first minute of the interview. He is in the rabid lion’s den of Israeli news. And look at his face, look at his smile, look how he maintains his cool. Look how he responds with dignity and integrity. The reason I’m telling you about all this on JewishMOM.com is because I want you to meet Naftali Bennett’s American JewishMOM and Dad (in the video below). Bennett’s parents made aliya from Berkeley, California right after the 6 Day War in 1967 and they became religious when Naftali was 3 years old. I love this interview because it reminds me how much difference the children of us idealistic American immigrants can make in Israel. But even for those of you who don’t live in Israel, Naftali Bennett’s story is a reminder of how much we can help the Jewish people and the world by having and raising children who are proud and committed Jews with strong values, like Miranda and Jim Bennett did. Vote for the Cutest Jewish Child Contest Winner! 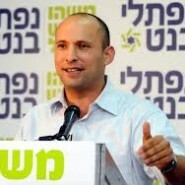 Isn’t Netanyahu going to do everything in his power to prevent Naftali Bennett from succeeding? I had teards in my eyes when Naftali’s mother said the last sentence in the interview! Thanks for sharing this. It’s very exciting news! the first video was blocked in u.s. on copyright grounds.